The 1945 United Kingdom general election was held on 5 July 1945, with polls in some constituencies delayed until 12 July and in Nelson and Colne until 19 July, because of local wakes weeks. The results were counted and declared on 26 July, to allow time to transport the votes of those serving overseas. The result was an unexpected landslide victory for Clement Attlee's Labour Party, over Winston Churchill's Conservatives. It was the first time the Conservatives had lost the popular vote since the 1906 election; they would not win it again until 1955. Labour won its first majority government, and a mandate to implement its postwar reforms. The 10.7% national swing from the Conservative Party to the Labour Party remains the largest ever achieved in a British general election. Held less than two months after VE Day, it was the first general election since 1935, as general elections had been suspended during the Second World War. Clement Attlee, Leader of the Labour Party, refused Winston Churchill's offer of continuing the wartime coalition until the Allied defeat of Japan. Parliament was dissolved on 15 June. The caretaker government led by Churchill was heavily defeated; the Labour Party under Attlee's leadership won a landslide victory, gaining a majority of 145 seats. The result of the election came as a major shock to the Conservatives, given the heroic status of Winston Churchill, but reflected the voters' belief that the Labour Party were better able to rebuild the country following the war than the Conservatives. Ralph Ingersoll reported in late 1940 that "Everywhere I went in London people admired [Churchill's] energy, his courage, his singleness of purpose. People said they didn't know what Britain would do without him. He was obviously respected. But no one felt he would be Prime Minister after the war. He was simply the right man in the right job at the right time. The time being the time of a desperate war with Britain's enemies". Henry Pelling, noting that polls showed a steady Labour lead after 1942, explained the long-term forces that caused the Labour landslide. He pointed to the usual swing against the party in power; the Conservative loss of initiative; wide fears of a return to the high unemployment of the 1930s; the theme that socialist planning would be more efficient in operating the economy; and the mistaken belief that Churchill would continue as Prime Minister regardless of the result. Though voters respected and liked Churchill's wartime record, they were more distrustful of the Conservative Party's domestic and foreign policy record in the late 1930s. Labour had also been given, during the war, the opportunity to display to the electorate their domestic competence in government, under men such as Attlee as Deputy Prime Minister, Herbert Morrison at the Home Office and Ernest Bevin at the Ministry of Labour. Churchill and the Conservatives are also generally considered to have run a poor campaign in comparison to Labour; Churchill's statement that Attlee's programme would require "some form of a Gestapo" to implement is considered to have been particularly poorly judged. The Labour manifesto 'Let Us Face the Future' included promises of nationalisation, economic planning, full employment, a National Health Service, and a system of social security. The Conservative manifesto, 'Mr. Churchill's Declaration to the Voters', on the other hand, included progressive ideas on key social issues but was relatively vague on the idea of post-war economic control; having been associated with high levels of unemployment in the 1930s, they failed to convince voters that they could effectively deal with it in a post-war Britain. This was the first election in which Labour gained a majority of seats, and also the first time it won a plurality of votes. The election was a disaster for the Liberal Party; it lost all its urban seats, while its leader Archibald Sinclair lost his rural seat of Caithness and Sutherland. According to Baines, the defeat marked its transition from being a party of government to a party of the political fringe. The National Liberal Party fared even worse, losing two-thirds of its seats and falling behind the Liberals in seat count for the first time since the parties split in 1931. This was the final election that the Liberal Nationals fought as an autonomous party, as they merged with the Conservative Party two years later, continuing to exist as a subsidiary party of the Conservatives until 1968. Future prominent figures who entered Parliament included Harold Wilson, James Callaghan, Barbara Castle, Michael Foot and Hugh Gaitskell. Future Conservative Prime Minister Harold Macmillan lost his seat, returning to Parliament at a by-election later in the year. This differs from the above list in including seats where the incumbent was standing down and therefore there was no possibility of any one person being defeated. The aim is to provide a comparison with the previous election. All comparisons are with the 1935 election. In other circumstances the change is due to the seat having been won by the gaining party in a by-election in the intervening years, and then retained in 1945. Such circumstances are marked with a †. With the Second World War coming to an end in Europe, the Labour Party decided to pull out of the wartime national coalition government, precipitating an election which took place in July 1945. King George VI dissolved Parliament, which had been sitting for ten years without an election. What followed was perhaps one of the greatest swings of public confidence of the twentieth century. In May 1945, the month in which the war in Europe ended, Churchill's approval ratings stood at 83%, although the Labour Party held an 18% lead as of February 1945. Labour won overwhelming support while Churchill "was both surprised and stunned" by the crushing defeat suffered by the Conservatives. The greatest factor in Labour's dramatic win appeared to be the policy of social reform. In one opinion poll, 41% of respondents considered housing to be the most important issue that faced the country, 15% stated the Labour policy of full employment, 7% mentioned social security, 6% nationalisation and just 5% international security, which was emphasised by the Conservatives. The Beveridge Report, published in 1942, proposed the creation of a welfare state. It called for a dramatic turn in British social policy, with provision for nationalised healthcare, expansion of state-funded education, National Insurance and a new housing policy. The report was extremely popular, and copies of its findings were widely purchased, turning it into a best-seller. The Labour Party adopted the report eagerly. The Conservatives accepted many of the principles of the report (Churchill did not regard the reforms as socialist), but claimed that they were not affordable. Labour offered a new comprehensive welfare policy, reflecting a consensus that social changes were needed. The Conservatives were not willing to make the same concessions that Labour proposed, and hence appeared out of step with public opinion. As Churchill's personal popularity remained high, the Conservatives were confident of victory and based much of their election campaign on this, rather than proposing new programmes. However, people distinguished between Churchill and his party—a contrast which Labour repeatedly emphasised throughout the campaign. Voters also harboured doubts over Churchill's ability to lead the country on the domestic front. 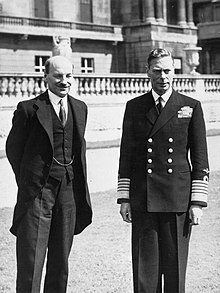 In addition to the poor Conservative general election strategy, Churchill went so far as to accuse Attlee of seeking to behave as a dictator, in spite of Attlee's service as part of Churchill's war cabinet. In the most famous incident of the campaign, Churchill's first election broadcast on 4 June backfired dramatically and memorably. Denouncing his former coalition partners, he declared that Labour "would have to fall back on some form of a Gestapo" to impose socialism on Britain. Attlee responded the next night by ironically thanking the Prime Minister for demonstrating to people the difference between Churchill the great wartime leader and Churchill the peacetime politician, and argued the case for public control of industry. Another blow to the Conservative campaign was the memory of the 1930s policy of appeasement, which had been conducted by Churchill's Conservative predecessors, Neville Chamberlain and Stanley Baldwin, and was at this stage widely discredited for allowing Adolf Hitler's Germany to become too powerful. Labour had strongly advocated appeasement until 1938. The inter-war period had been dominated by Conservatives. With the exception of two brief minority Labour governments in 1924 and 1929–1931, the Conservatives had been in power for its entirety. As a result, the Conservatives were generally blamed for the era's mistakes, not merely for appeasement but for the inflation and unemployment of the Great Depression. Many voters felt that while the war of 1914–1918 had been won, the peace that followed had been lost. Labour played to the concept of "winning the peace" that would follow the Second World War. Possibly for this reason, there was especially strong support for Labour in the armed services, who feared the unemployment and homelessness to which the soldiers of the First World War had returned. It has been claimed that the pro left-wing bias of teachers in the armed services was a contributing factor, but this argument has generally not carried much weight, and the failure of the Conservative governments in the 1920s to deliver a "land fit for heroes" was likely more important. The role of propaganda films produced during the war, which were shown to both military and civilian audiences, is also seen as a contributory factor due to their general optimism about the future, which meshed with the Labour Party's campaigning in 1945 better than with that of the Conservatives. Writer and soldier Anthony Burgess remarked that Churchill—who often wore a colonel's uniform at this time—himself was not nearly as popular with soldiers at the front as with officers and civilians: he noted that Churchill often smoked cigars in front of soldiers who had not had a decent cigarette in days. The differing strategies of the two parties during wartime also gave Labour an advantage. Labour continued to attack pre-war Conservative governments for their inactivity in tackling Hitler, reviving the economy, and re-arming Britain, while Churchill was less interested in furthering his party, much to the chagrin of many of its members and MPs. ^ Insert shows results in the Parliamentary County of London. Map excludes Northern Ireland. ^ All parties shown. Conservative total includes Ulster Unionists. The 8 seats won by National Labour in 1935 were not defended. ^ Rowe 2004, p. 37. ^ a b c d e f Lynch 2008, p. 4. ^ Ingersoll 1940, p. 127. ^ Pelling 1980, pp. 399–414. ^ a b Thomas & Willis 2016, pp. 154–155. ^ Marr 2008, pp. 5–6. ^ Lynch 2008, p. 10. ^ Burgess 1987, p. 305. ^ Lynch 2008, pp. 1–4. Wikimedia Commons has media related to 1945 UK General election.